Money is, according to me the biggest reason why people start blogging. Whether they like it or not, they keep doing it for the sake of money. After a while most quit after acknowledging it is not easy and fast money.
" Blogging is NOT a Get-Rich-Quick Scheme, It is more like a #workforfreeforalongtimeandthenreapyouraward type of plan. " You can put affiliate links to the products which suits your blog and can attract traffic to your site. If people find products related to your content and buy it then you will get a commission. We all know this by now okay? The biggest problem with this method is that you need a gigantic amount of traffic to your site since very very few percentage of people actually make purchase from your affiliate link to be honest. Also spamming your blog with affiliate links will only do harm to you. I know you will argue that bloggers earn thousands of dollars with this. But there is a huge difference between you and them. Not in a way of whos’ big and whos’ not but the way they use their links. They have a well equipped team of writers, SEO experts, marketers etc. which I have discussed in detail later in this article. That is what makes the difference. This one is also very common. Start writing a blog and then wait till it get adsense approved and then put ads on your blog to monetize it every time someone clicks your ad. Problem is that it pays so less that with time you will realize how slow it is. It will earn you some money, I am not saying this is waste but you can make only 2 or 3figure income with adsense. Meh….. This doesn’t mean it is not useful. For part-timers it works, but you cannot depend your living on this can you? There are so many other ways to monetize your blog and site (these two being most common and popular) but it will not make any visible or effective difference. I am not demotivating. I am just mentioning the reality. That’s the truth why people quit even when they have everything. 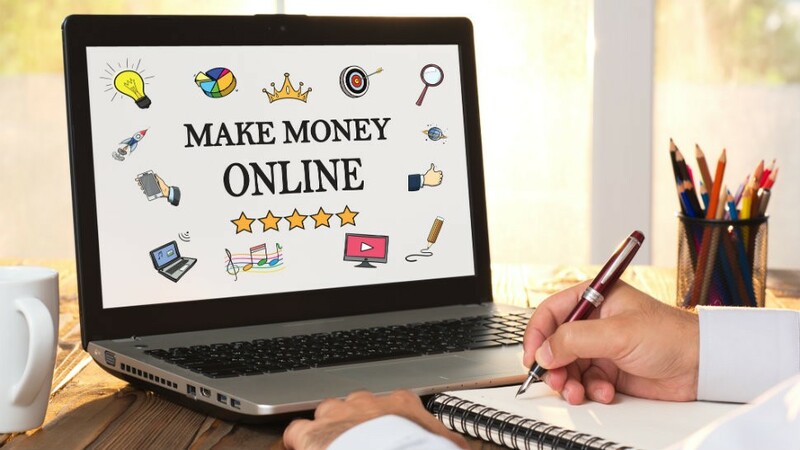 Yes, you can earn money and monetize your blogs easily with some of these ways but they earn you so less that you will at one time think that it is just waste of time and effort. So are there any better ways to make money? Money is the thing we say ‘the more the better’. So what is it? What are the ways that you can earn enough to actually see worth in the time invested? And I mean big bucks. 4 Figure, 5 figure and even 6 figure income just by blogging!! PS : All of the methods mentioned below will only work if you have plenty of visitors and good traffic to your blog. So make sure you read How To Bring traffic to Your blog. It is a great article which will help you a lot in building audience for your blog. Sell products, Sell Services, Sell whatever you can do insanely multiply your profit margins. You will get traffic, you will get visitors, your product will be recognized by people all over the world. Even people share your page more often since it might be cool innovative new product which might fill the gaps and your product or service might even be useful for some people. Working on this will actually result in drastic change sooner or later. If you do not have any product of your own then you might promote other’s product if you have handsome amount of engaging active visitors on your blog. I have written a whole another blog on How To Sell Your Product Online with Marketing. But to achieve this ability to sell products you should be good at convincing and internet marketing is the skill to be learnt for this. There are tonnes of sites available on internet who offer you free, paid or even premium courses to learn marketing. I know this is harder than regular blogging and even require learning new skill and requires a little more work.. but if you can spend some time blogging then spending a little of 10-15 minutes extra on learning this should not be a deal breaker. After all, you will be making a lot more than regular blogging. Keep yourself available for promotions, review the products rate it. Mention Pros and Cons to new products or less used and reviewed (mostly underrated) products so that people who are interested to buy those products will have to face less difficulty finding if the product is worth their precious money or not. But don’t be a fool and keep doing that by spending your money but buying it yourself. Ask the manufacturer for a review unit which you might have to return after the review or not. That depends. But promoting the products which are already advertised a lot and is reviewed by almost every blogger in that niche will not make a difference at all. This will bring Traffic, Review units to you and also sponsorship from brands if you mention them in your blogs or website. But make sure you stick to your niche. If you promote all kind of products, your audience will scatter soon. Once you set your foot then it becomes easier for you to hunt down products and review them. Reviewing is one kind of promotion for me since your audience after reading your blog will come to know about hows’, who’s and Whats’ of the product or service extravaganza. Okay so you want 10X faster growth of you blog or website then you know you have to write 20X more articles and blogs and invest 100X more time in writing, promoting, optimizing etc. which is not possible keeping in mind that you are maintaining it as a ‘part time’ work. Solution you know after reading the sub-heading. Hire a Team. Now this is completely optional and very few choose this way of boosting their growth but it most of the time works. Hiring a team of non-specialist but experienced writers. SEO specialist are most necessary since they have main task of displaying the content made to a bigger audience by optimizing your site to rank high on search engines. Rest you all know. I am not going to mention each and everything here so you don’t think I am under estimating my reader’s intelligence. If you still need to know about this in detail then you can always e-mail me or ask me in comments below. All big pages like HuffPost, ShoutMeLoud, SmartBlogger etc. have a well made team of Experienced writers, SEO experts, Marketers etc. That is the reason why you find their monthly earning on google be like $100,000 or even a million dollars (out of which not all is profit). They earn so much because they spend a lot where required. Smartly. So, at the end I can say that the decision is yours. If you want to do simple blogging for relaxing and just to earn few dollars then keep it simple. It does not require hustling all the time and do not need any management skills or things like that. Keep it simple and do it for fun as a side work. But if you want that big brand of your website or product then you need to hustle. Hustle till you become what you aimed for. It is a lot of pressure and brain storming. But once you get past that, you know the fruit is sweet. "Blogging is hard because of the grind required to say Interesting and Relevant "